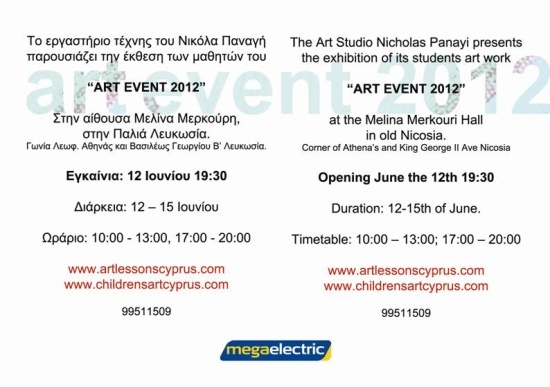 The art studio Nicholas Panayi presents the exhibition of its students work “ART EVENT 2o12” from Tuesday the 12th of June until Friday the 15th of June 2012 at the Melina Merkuri hall in the old town of Nicosia. 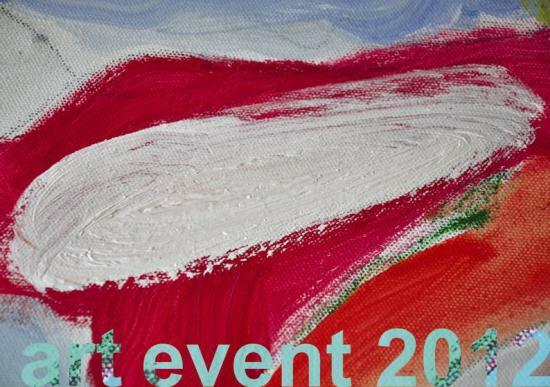 This event enables cultural development and makes people more sensitive to the arts. The goal of this exhibition is to show the work of the students and the different ways of developing a variety of themes. This offers a opportunities for both the viewer and the creator to meditate on creative expressions. Works will be presented from all the departments of the school. A. The children’s department ages from 3-12 with the responsible teacher Sofia Alexandra Dias Panayi James. The children’s department will present interesting work based on the children’s soul with all the dynamic tenderness and honesty witch characterizes it. Simple themes such as the human being, nature’s beauty, the animal kingdom, history of art, the city and many more are presented using a variety of materials such as paper, cardboard, clay and more in different sizes some times even surpassing the size of the child itself. B. The following departments with the responsible teachers Nicholas Panayi, Fotis Theodoropoulos, Panayiotis Pansantas, and Marina Erodotou. 1) Art for children ages 12 and up. 3) Portfolio preparatory work for universities in Europe and the <?xml:namespace prefix = st1 ns = "urn:schemas-microsoft-com:office:smarttags" />USA in fine art, design and architecture. 4) The FOUNDATION COURSE IN ART AND DESIGN for the direct entry in foreign universities for the BA course. 6) Art as a hobby for all ages.